“POLAND. 1948. Tereszka, a child in a residence for disturbed children. 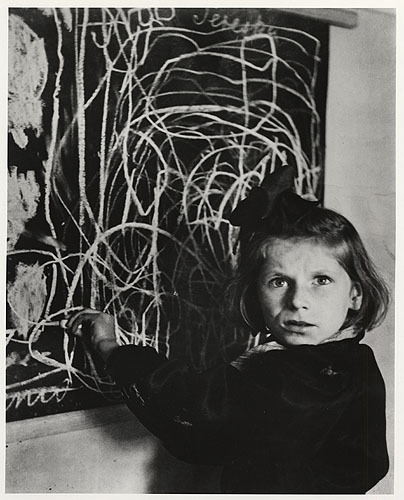 She drew a picture of ‘home’ on the blackboard.” © David Seymour/Magnum Photos. Published with permission. Original caption. Where is home? For any of us? What does it mean to belong? Since the executive order on immigration was signed, I’ve been haunted by a photograph taken by my great uncle David Seymour “Chim” in a Warsaw orphanage in 1948. In it, Tereszka, a displaced child, draws a picture of “home.” Tereszka’s eyes have been with me since I can remember, a reminder of the lucky circumstances of history that enabled my grandparents to build a new home in the US after arriving as Jewish refugees from Poland via France in 1940. Today her eyes bear a new incredulity. Conversations with diverse friends and students since the executive order on immigration was signed have revealed that our collective sense of home is shaken. Our individual reckoning with this unsettling historical moment may differ depending upon our personal constellation of citizenship and residence documentation (or lack thereof), religious affiliation, physical appearance and geo-social location. But Tereszka’s photo should remind us all how quickly lives may be unraveled through violence, war, displacement, and policies such as the travel ban. In theory, the logic of the executive order is predicated on the fiction that people feel at home within the boundaries of the nation-state in which they hold the documentary trappings of citizenship, and therefore have the option to simply stay or return there. In practice, despite its temporary judicial suspension, the order’s implementation at various border points clarifies in real, human terms that whether by blood or descent, our ties to the nation-state that issues our citizenship documents (or refuses to do so) do not necessarily determine where we feel most at home. This disjuncture between what we might call the documentary and affective dimensions of citizenship is a focus of my anthropological research in South Asia, and the Himalayas, as well as part of my family history and life trajectory. As a second-generation Jewish American, I am now resident in Canada on the unceded territories of the Musqueam people. The home that I make for my children here is premised on the colonial usurpation of others’ traditional territories and homes, violence not unlike the historical and contemporary aggressions elsewhere that have compelled so many to seek refuge in the US. “AUSTRIA. Vienna. 1948. A little boy with a homemade toy, a Red Indian village of wigwams and stockade constructed from wood and cardboard. Behind him are the ruins of a much-bombed and damaged Vienna.” © David Seymour/Magnum Photos. Published with permission. Original caption. The travel ban prevents people fleeing such oppression from finding new homes, as well as those who have made their home for years in the US from returning to it. For me, the executive order feels like a betrayal of “home”, the place where my forbears found refuge. I say this from a position of privilege as a white permanent resident of Canada, but the emotional loss of the country that my grandparents and parents believed in is real. The executive order was signed on Holocaust Remembrance Day. The president’s statement on that occasion excluded Jews, and was hailed by white supremacist leaders as a necessary “de-judaification” of history. The objective seems evident: to erase the history of past forms of exclusion and violence in order to facilitate new ones, as Holocaust historian Timothy Snyder explained in a recent interview. By the end of January 2017, 48 Jewish centers in the US had received bomb threats. These threats are not only a “Jewish issue”, just as the travel ban is not only a “Muslim issue”. While recognizing the specific pain of those directly affected in each case, we need to address these issues systemically, as part of a whole. Those once oppressed may also become oppressors, victims can become perpetrators. Recognizing this is another way of countering attempts to reduce all members of any group to a singular stereotype or ideological position. This means challenging Israel’s politics of occupation, settlement and wall-building at the same time that we work to remember the Holocaust. The US administration has directly cited the Israeli experience as evidence that “the wall works”, and is reportedly seeking Israeli advice on building the US/Mexico wall . These confluences indicate the need for careful attention to situated histories and the granular questions of how specific exclusions are produced—who the agents are and what motivates them—to complement large-scale political resistance. Connecting the dots between micro and macro, across space and time, is one of the roles for anthropology and other critical social sciences in this moment. There is a pressing need to recognize oppression and exclusion in both particular and universal forms. We must share stories beyond our own communities, but in ways that can be grasped by others who know little of our own pasts. The travel ban strips us all of the agency to build our own senses of home. Instead, it over-identifies all citizens with their putative state, rather than recognizing that many people are at odds with the states in which they were born or hold citizenship. Many of those seeking entry to the US now do so on humanitarian grounds, just like those of earlier generations. My grandparents could no more remain in Poland than Syrian refugees today have the option to stay at home. Documentary citizenship from the nation-state which claims the territory in which they were born offers no relief. “For decades some 4 million people in the Terai region of southern Nepal could not acquire citizenship certificates, as the Nepali government claimed they were from India, not Nepal. While citizenship was extended to millions of people in 2007, it is estimated that several hundred thousand in the region are still excluded from citizenship, primarily those from lower castes, specifically the Dalit, or untouchables. Walking several hours from their remote village, three Dalit carry bundles of firewood to sell in the markets of Lahan.” © Greg Constantine. Published with permission. In other cases, such as for the over 4 million stateless people in Nepal, the problem of being citizenshipless is not a product of displacement, but rather of birth within the territorial boundaries of a state that will not acknowledge entire categories of people as its legitimate citizens due to their ethnic identity or family history. And yet there is no other place to which they belong. The larger problem, then, is the Westphalian nation-state system and its presumption of a direct correlation between territorial location and a singular citizenship for each of us. By the same token, as Audra Simpson powerfully explains in Mohawk Interruptus, American citizenship—like that of many contemporary nation-states—is premised upon the disavowal of indigenous sovereignties, and is therefore a site of refusal for many. For such reasons, the historical accident of my own US citizenship feels both fortunate and perpetually fraught. It is ironic that corporations (including universities) idealize the so-called “global citizen” when s/he begins as a citizen of a handful of states in the Global North and travels elsewhere to proselytize the virtues of capitalism, democracy or “development.” Yet these organizations reject this concept when the direction of movement is reversed. Many universities have released strong statements condemning the travel ban; we should also urge them to rethink the notion of “global citizenship” that undergirds many of their initiatives. We are not all immigrants, we are not all global citizens, but we are all human. We all deserve to make our homes in peace, while never forgetting the specific historical circumstances that have delivered us here, often destroying other homes along the way. We must ask ourselves: What historical circumstances have enabled each of us to make our home, wherever we are? How do we make it a just and inclusive home now? How can we help others find home in difficult times? Tereszka’s eyes demand nothing less. *This essay is based on my short talk at “Ban the Ban,” an event held at University of British Columbia on February 3, 2017. I am grateful to the organizers and participants of that event. Sara Shneiderman is Assistant Professor in Anthropology and the Institute of Asian Research at the University of British Columbia. She is the author of Rituals of Ethnicity: Thangmi Identities Between Nepal and India (University of Pennsylvania Press, 2015), along with several articles on the themes of Nepal’s Maoist and indigenous movements; ethnic classification, affirmative action, and the politics of recognition in South Asia; and borders and citizenship in the Himalaya. Her current research explores the politics of reconstruction in Nepal’s post-conflict, post-disaster transformation, focusing on dynamics of citizenship, territory and religiosity.